“Farnsworth’s Image Dissector worked pretty well, but it was not sensitive enough to capture scenes unless there was lots of light. Very hot and bright arc lights sometimes had to be used, and these made it hard for people to stand near the camera. Although Farnsworth improved the tube later and showed how it could be used for TV, his competitors at RCA, most notably Vladimir Zworykin, were working on a different tube they call the Iconoscope. 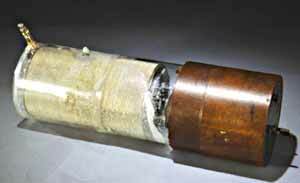 When commercial broadcasts began in the late 1930s, Farnsworth’s tube was left behind. However, it had certain advantages over the Iconoscope, and it remained in use for many years, but not for regular TV. There were certain uses of closed-circuit TV where an Image Dissector was useful, such as when engineers wanted to monitor the bright, hot interior of an industrial furnace.